The response to inclination in plants is an attractive and extensively studied biological process. The most commonly held theory proposes a differential growth in stem tissue due to unequal auxin redistribution. 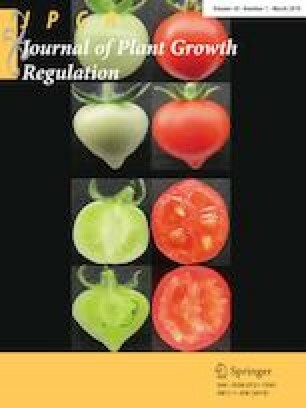 Further evidence proposed that flavonoids act as molecular regulators of auxin distribution or flux. It is well known that flavonoids affect auxin distribution, but how intracellular concentration is controlled during the gravitropic response in woody species is still unknown. The MATE family has been widely studied, however the molecular basis of flavonoids transport is still poorly understood. Here, we identified and characterized a full-length cDNA from radiate pine encoding a putative MATE protein. Transcript abundance analysis showed that PrMATE1 is expressed in a spatial and temporal manner in inclined stems. Additionally, PrMATE1 fused to GFP is mainly localized in the vacuolar membrane. A 3D protein model showed 12 transmembrane helices and an open cavity. The protein–ligand interaction was evaluated; favourable binding affinity energies were obtained and suggested epicatechin 3′-O-glucoside as the best putative ligand. In silico mutagenesis analysis was used to identify five residues as important to protein–ligand interaction. The data provide a dynamic view of interaction between PrMATE1 and their putative ligands at the molecular scale. Luis Morales-Quintana and Daniel Bustos have contributed equally to this work. The online version of this article ( https://doi.org/10.1007/s00344-018-9801-3) contains supplementary material, which is available to authorized users. This work has been supported by PAI/Academia Nº 79140027, FONDECYT N° 11121170, and FONDECYT N° 1150964. PR acknowledges ‘Núcleo Científico Multidisciplinario’ from Universidad de Talca. Authors would like to thank the reviewers for their highly valuable comments. The authors declares that they have no conflict of interest.